BETTER THAN YOUR BREAKFAST CEREAL, BAGEL, OR TOAST. I blog with as purpose. Exposure of myself – for myself; specifically for YOU. As I embark on climbing up the ladder of achievement in my life, I realized it comes with a “price tag”. This tag, requires me to have the ability to keep a laser focus on the target, regardless of the weather, circumstances, or obstacles, neither my focus nor concerns rest on current circumstances. Come by the gym, and everyday you’ll catch me sporting a grin from internal joy. Behind that joy are ideas, visions, and dreams that need to be walked out and fulfilled, not by myself, on the contrary, by YOU or someone you know. In the pursuit of reaching my greatest desires, however, I had to understand what the word transparent meant for me. Through lengthy ananlyzing, I soon realized many individuals around me have difficulties with being transparent. A transparent life, many would agree, is having the ease of being 100% honest, truthful, or like we say in NY “keeping real”. Therefore, when Imeet somebody for the first time they gain a sense of authenticity. As I look forward, what’s my goal? YOU are. One day you’ll come across the blog with exactly the words to draw your attention closer. Now it’s time for us to get SERIOUS. About your choices to eat. Quite often, stove tops across the country are dressed with nothing more than bareness, until rat race ends. Currently, unless you’re a stay-at-home mom or work-from-home dad, the odds of you serving yourself up with a hearty, healthy meal is less than winning the lottery. Choice A. An apple a day. Seriously grab a piece of fruit: an apple, orange, pear, or bag of berries AND a bag of raw nuts: almonds, pecans, or walnuts. Go with raw nuts if possible to prevent the polyunsaturated fats from oxidizing as can happen in roasted nuts. But even roasted nuts are a better option compared to cereals or bagels. Supercharge: blend those fruits and nuts with my “Dynamic Duo” (Classic and Innergize) to get the best, tasting and simple prepping supply of vitamins, nurtrients, and more; which means a healthy energy lift, plus more PRODUCTIVE hours in the day, and a better quality of life. Time is precious and so is YOUR health. Choice B. Another great option for a healthy breakfast is two hard boiled eggs and veggie sticks. You can’t go wrong with this nutrient-rich breakfast as it’s the perfect breakfast to drop the fat and keep your blood sugar and appetite 100% controlled. Choice C: Want a little extra protein to go with this breakfast too? 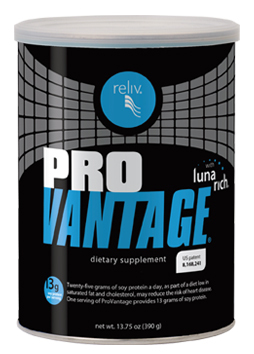 One quick scoop of a quality protein – Provantage – meets the nutritional needs, whether you’re in the gym or maintaining your garden, to IMPROVE performance, endurance, recovery and repair. Great for athletes who deal with joint aches from grueling sport injuries. I should know, after 17 years of football I’ve experienced my fair share of visits to trainers table. Well, that’s all folks. A perfect breakfast menu at your disposal! Rotate all 3 of these ideas if you need variety each week. Posted on January 12, 2012, in Energy, Nutrition, Prevention and tagged bagel, breakfast, cereal, classic, exposure, fibrestore, gamechanger, healthy choices, innergize, optimal nutrition, provantage, reliv, snacks, toast. Bookmark the permalink. Leave a comment.